• Cushing's syndrome results from chronic exposure to excessive levels of glucocorticoids. • Cushing's syndrome may be ACTH dependent (pituitary or ectopic tumors) or ACTH independent (exogenous glucocorticoids). • Reddish purple striae, plethora, proximal muscle weakness, easy bruising, and unexplained osteoporosis are discriminatory symptoms. • CT or MRI of the adrenals may differentiate between the various types of ACTH-independent Cushing's syndrome. (Cushing's disease) or from ectopic tumors secreting ACTH or CRH. ACTH-independent adrenal production of cortisol is caused by adrenocortical tumors or hyperplasias. However, the most common cause of Cushing's syndrome is iatrogenic from exogenous glucocorticoid administration. Certain psychiatric disorders (anxiety, depression), poorly controlled diabetes, and alcoholism can be associated with mild hyper-cortisolism and may produce results suggestive of Cushing's syndrome (Nieman et al., 2009). Although Cushing's syndrome might be easy to diagnose when full blown, the diagnosis can be challenging in mild cases. The spectrum of clinical presentation is broad. Some discriminatory symptoms include reddish purple striae, plethora, proximal muscle weakness, bruising without any obvious trauma, and unexplained osteoporosis. More often, patients present with features caused by cortisol excess, such as obesity, depression, diabetes, hypertension, or menstrual irregularity. Dorsocervical fat pad (buffalo hump), facial and supraclavicular fullness, thin skin, peripheral edema, hirsut-ism or female balding, and poor skin healing are typically seen in Cushing's syndrome. Children usually have slow growth, abnormal genital virilization, short stature, and pseudoprecocious or delayed puberty. Before the diagnosis of Cushing's syndrome is considered, exogenous intake of glucocorticoids should be excluded. According to the 2008 Endocrine Society Clinical Practice Guidelines, tests to consider for diagnosis include urine free cortisol (UFC), late-night salivary cortisol, 1-mg overnight dexamethasone suppression test (DST), or the longer, low-dose DST (2 mg/day for 48 hours). UFC and salivary cortisol should be obtained at least twice. The diagnosis of Cushing's syndrome is made if two tests are unequivocally abnormal. The diagnostic accuracy of other tests previously used, such as random cortisol levels, is too low to recommend them for testing (Fig. 35-3). The UFC provides an integrated assessment of cortisol secretion over 24 hours and measures the cortisol not bound to cortisol-binding globulin (CBG). Unlike serum cortisol, which measures both free and CBG-bound cortisol, UFC is not affected by conditions and medications that alter CBG. A 24-hour urine cortisol secretion or an overnight urine sample (10 pm to 8 am) can be ordered in conjunction with urine creatinine to ensure accuracy of the results. UFC reflects renal filtration, and values are significantly lower in moderate to severe renal impairment. A patient can be assumed to have Cushing's syndrome if basal urinary cortisol secretion is more than three times the upper limit of normal and one other test is abnormal. However, UFC may be normal in patients with mild Cushing's syndrome, in whom salivary cortisol may be more useful. Late-night salivary cortisol is usually measured at bedtime or between 11 pm and 12 am as the loss of circadian rhythm, with absence of a late-night cortisol nadir, is a consistent biochemical abnormality with Cushing's syndrome. The active free cortisol in the blood is in equilibrium with cortisol in the saliva, and the concentration of salivary cortisol does not appear to be affected by the rate of saliva production. Overall in adults, the accuracy of the test is similar to that of UFC. Various protocols have been used for the DST but most often, 1 mg of dexamethasone is given between 11 pm and 12 am and cortisol measured between 8 and 9 am the following morning. In patients with endogenous Cushing's syndrome, a low dose of dexamethasone fails to suppress ACTH and cortisol secretion. 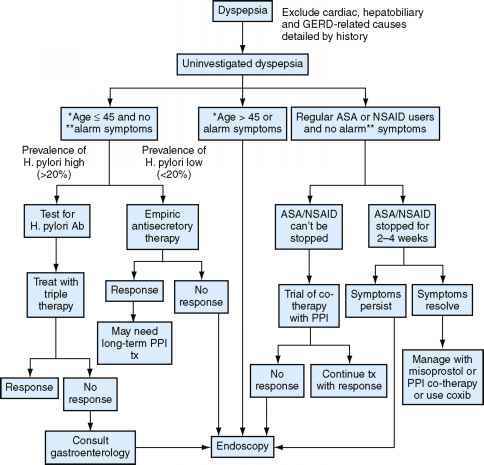 A normal response is a serum cortisol of 5 ^/dL or less. To enhance DST sensitivity, experts advocate requiring a lower cutoff for suppression of the serum cortisol to 1.8 ^/dL or less to achieve sensitivity rates greater than 95%. may be helpful in conditions with overactivation of the HPA axis but without true Cushing's syndrome, such as in certain psychiatric disorders, obesity, and alcoholism. Dexamethasone is given in doses of 0.5 mg every 6 hours for 48 hours, beginning at 9 am on day 1, at 6-hour intervals (at 9 am, 3 pm, 9 pm, and 3 am). Serum cortisol is measured at 9 am, 6 hours after the last dose of dexamethasone (Funder et al., 2008). 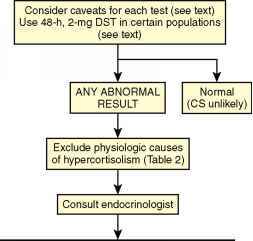 Additional testing is recommended for patients with initial abnormal or discordant results, such as the dexamethasone-CRH stimulation test or the midnight serum cortisol test. The dexamethasone-CRH stimulation test has been developed to improve the sensitivity of the LDDST. Dexamethasone at 2 mg/day over 48 hours is followed by administration of CRH (1 ^/kg IV) 2 hours after the last dose of dexamethasone. Cortisol is measured 15 minutes later. ACTH and cortisol should increase after administration of CRH in patients with Cushing's disease. After hypersecretion of cortisol is confirmed, the next step is to determine if the Cushing's syndrome is ACTH dependent or independent. This is accomplished through measurement of the late-afternoon ACTH level, which is normally low. Cushing's syndrome is ACTH dependent if plasma ACTH is greater than 10 pg/mL and ACTH independent if ACTH is less than 5 pg/mL. For an intermediate ACTH level, further testing with the CRH stimulation test is performed. A rise in cortisol by 20% or in ACTH of at least 50% over baseline after administration of CRH is considered evidence for an ACTH-dependent lesion. In these patients, high-dose dexametha-sone suppression test (HDDST), combined with cranial MRI studies, may help in localizing the site of ACTH overproduction. HDDST (2 mg dexamethasone every 6 hours for 2 days) provides close to 100% specificity if the criterion used is suppression of urinary free cortisol by more than 90% and can differentiate Cushing's disease from ectopic ACTH production. If workup results are still equivocal, or suggestive of ectopic ACTH production, inferior petrosal sampling is performed, obtaining ACTH samples from the periphery and petrosal sinuses simultaneously. A petrosal sinus/peripheral ACTH ratio of 2:1 is diagnostic of a pituitary source and can be further used to localize the side of ACTH production from the pituitary gland. For patients with ACTH-independent lesions, abdominal CT or MRI may localize the site of the lesion. The treatment of Cushing's syndrome depends on the cause. For endogenous disease, surgical resection of the causative tumor is indicated. The treatment of choice for Cushing's disease is transsphenoidal hypophysectomy. Other treatments include various forms of radiation therapy and phar-macologic inhibition of ACTH secretion. Patients with adrenal adenomas are treated with unilateral adrenalectomy and have excellent prognosis. These patients require glucocorticoid therapy both during and after surgery until the residual adrenal gland recovers. For patients with biopsy-proven adrenal carcinoma that is not amenable to surgery, mitotane is the treatment of choice. For ectopic ACTH syndrome, ideal treatment is the excision of identified benign tumors. However, for ectopic tumors that are unidentified or unresectable, medications that block ste-roidogenesis, such as ketoconazole, metyrapone, and ami-noglutethimide, may be useful.